It’s back to school time! And that means dyeing thread for all my fall classes. The threads you see above are destined for my students as part of their class kits. 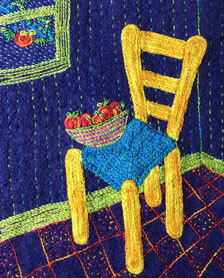 Whether taking a quilting class or hand embroidery class, everybody gets some colorful thread. Ooooooh! Aren’t they pretty! These threads are dyed using the “random acts of dyeing” method. I don’t following the repeatable color formulas for Artfabrik threads. Instead, I use up all my left over dye stock to dye threads in random colorways. It’s a great way to discover new color combinations and prepare for my classes at the same time. See you in the classroom! Can You Name This Colorway? My heart goes out to those who must give names to every paint swatch in Home Depot. Thinking up color names for the fabric and threads I dye is so very taxing. Ah, the drudgery of it all! Thankfully I have friends and family with imaginations. They have helped me name most of the colorways dyed for Artfabrik. Can you guess what this colorway is called? Rhubarb! Yes, you are correct! Today I picked my rhubarb, gave it a bath, and froze it for future rhubarb goodies that, with any luck, someone else will make. On occasion I like to look organized. This doesn’t happen often, so I’d like to share this rare moment with you. Here you see my hand dyed pearl cotton threads neatly stored in drawers. They are sorted by size (3, 5, 8, 12) and colorway. Organized, right? And then there’s this. Never wash your skeins of hand-dyed thread in the washing machine or people will think your are disorganized. How do you keep your threads organized?